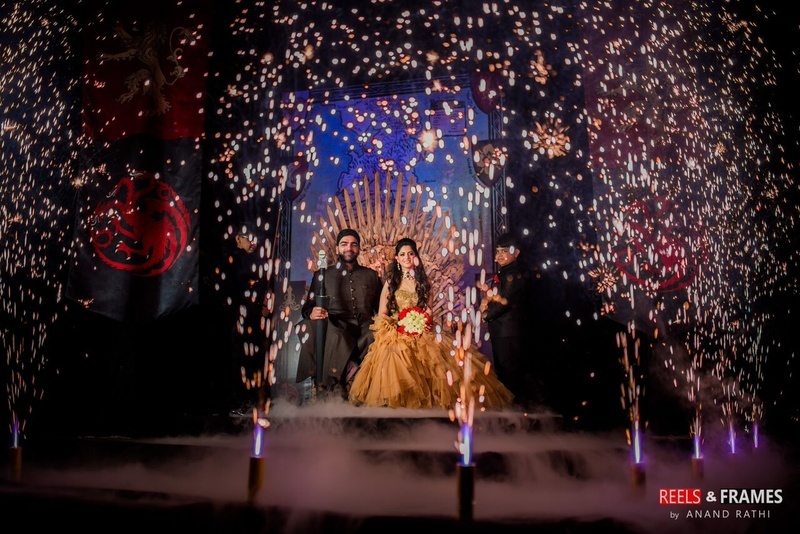 This Couple Had A Game Of Thrones Sangeet Night – Complete, With The Iron Throne! So the new Game of Thrones season out and everyone is super-psyched about it. And just in time, the pictures from Shaurya and Sanjna’s sangeet night dropped into our inboxes. Their Sangeet theme had us going gaga over all the Game of Thrones inspired décor and outfits. What perfect timing, right? Right from the iron throne to flaming torches, house sigils and even dragon eggs, their decorator F5 Weddings nailed each element of the event. And the team and Reels and Frames brilliantly photographed all the key details! At first, Shaurya had some difficulty in getting his parents to visualise it but eventually they came around and left the ball in his court. Next, he had to convince his friends that it wasn’t a joke! But all in all, the weeks of ideation, efforts and execution were all worth it and they managed to strike the perfect balance between Game of Thrones and a Punjabi family’s Sangeet and Cocktail. Apart from the iron throne and the house sigils, the décor also involved the Longclaw sword that Shaurya carried. They even had dragon eggs and 30 kilos of cotton which substituted for the snow (referencing ‘Winter is here’). We also loved the photo-booth and Prince Joffrey’s shooting game! The entire set-up really gave of the G.O.T vibe, what with the Winds of Winter track playing in the background! Their outfits were custom-made by Nikhil of Shantanu and Nikhil (who is a G.O.T fan himself and managed to nail the look).